As I mentioned in my previous article, there are few good resources on Islamic swords for the general reader. Today I’m going to draw heavily on the articles by Dr. A. Rahmmn Zaky: Introduction to the study of Islamic Arms and Armour, which provides a short introduction to the main types of swords found in Islamic cultures; and the article by Dr. Robert Elgood: An introduction to Arms and Armor from the Islamic world and India, which provides a detailed historical, religious and cultural overview on which to baFse our understanding. While the swords in Dr. Zaky’s paper are themselves are listed alphabetically, he references them by the nationality / cultures which tended to use them. Dr. Elgood notes that Islamic tradition had a heavy effect on sword designs and decoration; similarly, he notes that various Islamic states could potential draw warriors from a variety of different cultures who, having committed themselves to aiding the Islamic empire, might easily have damaged blades from their homeland repaired or decorated in the style of their present abode, leading to some confusion as to the origin of the blade in question. Dr. Elwood also notes that “…the names in any single language may be spelt in a variety of forms. Some are more familiar to collectors than others. In any society the same object may be known by a multiplicity of names… …The Arabic word for a sword, saif, covers a wide variety of swords of different shapes from various countries.” Thus there can be some discussion as to precisely which sword(s) historical treatises are referring to. Note: Wherever copyright allows, I will be posting pictures of the weapons in question. However, finding copyright-free, good-quality images of these weapons has proven problematic. Therefore, where necessary, I will be providing links to the images on web sites or services where I am unable to obtain permission to post the picture directly. Described as being a long, singled edged sword, with a straight back and a very long point. The width of the blade varies, being widest at the center of percussion, narrowing as it moves towards the hilt, then widening again. Often decorated, engraved and inlaid. The hilts tend to be small-ish, with one-side grip and pommel (sabre-type). Double-edged straight blade with a plain-crossguard. Wikipedia lists it as a: “…sword characteristic of Sudan, Chad, and Eritrea. The blade of the kaskara was usually about a yard long, double edged and with a spatulate tip”; the entry also cites an authority who says “…in the central and eastern Sudan, from Chad through Darfur and across to the Red Sea province, the straight, double-edged swords known as kaskara were an essential possession of most men”. More detail here. The classic scabbard for this blade includes a bulbous extension near the scabbard tip. 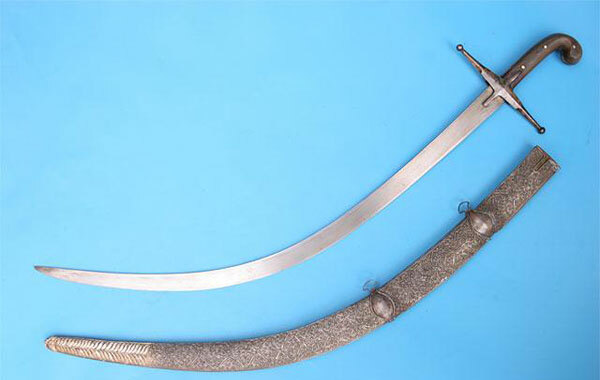 The classic Turkish sabre. Dr. Zaky describes it as “…broader, shorter and less curved than the Persian shamshir, having a fair curve, with the curve stopping some 10 inches to the point. The blade then widens out abruptly and extends to the point nearly in a straight line, with a sharp edge on the back.” He notes this design allows the kiliji to thrust (unlike the shamshir), but not very effectively. The hilt is described as pistol-shaped, most often made of horn; the cross-guard is short, often with balls or acorn decorations. The shape of the blade requires the top-back of the scabbard have a slit to permit the sword to be sheathed. In later periods this opening had spring-loaded or hinged clasps. A short sabre often found with the bottom cross-guard extending down, becoming a knuckle-guard, and connecting to the pommel. A sword with a curved blade, short quillions curving towards the blade, and a round hand-guard. Considered a variety of the tulwar. 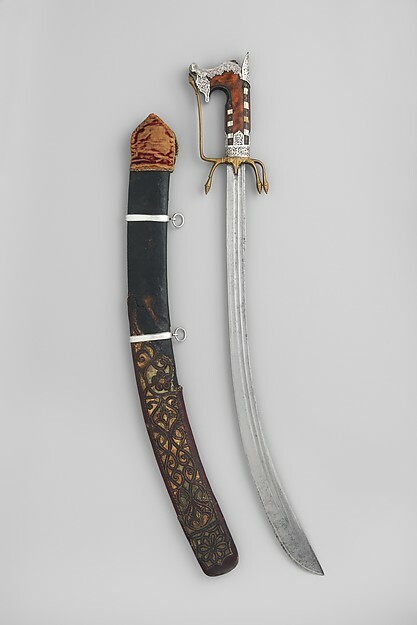 Described as the national sword of Moslem Georgia, according to Wikipedia a “…type of long and wide double edged fighting knife or short sword, native to Circassia and neighboring regions in the Caucasus“. Thought to be the precursor to the Cossack dagger. A broad-bladed sword with a heavy curve and a hooked pommel. Saif / scimitars came into use after the 14th century, and were popular for being lighter in weight than a broadsword, and for their heavily curved design, which made slashing from horseback very easy. Nationality / Region: Arabic peninsula , though the shamshir is considered a Persian blade, are often inscribed, with simple hooked cross-guards. Common to the Caucasus, described as being a mostly straight sword with a light curve near the tip, making it effective for both thrusting and slashing. It has no cross-guard. 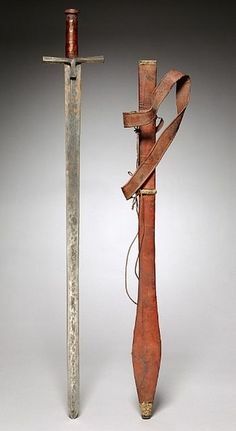 Possibly the forerunner of the Cossack sabre. Nationality / Region: Caucasus and Russia. A double-edged, diamond-shaped blade with a deep-curve, almost a half-circle. An average blade is about 40 inches in length, measured along the entire length of the blade. However, a direct line from hilt to tip is only about 30 inches, the curve of the blade accounting for the extra length. A straight, single-edged sword with a pronounced taper towards the tip, with either a simple, straight cross-guard or totally lacking one. A very common class of weapon, which includes most of the swords of India. The typical talwar has a both a lesser curve and wider blade than the scimitar / shamshir, and lacks the yelman (false-edge) of the kiliji. A relatively short, inward curving sabre, almost exclusively used in Ottoman Turkey and its provinces. The inward-curve is designed to aid in cutting; most yatagan have no guard, but the large, plate-like pommel which spreads out like wings. Most are 60 to 80 cm in length. Islamic Swords and Swordsmiths (Out of print): Ünsal Yücel, translation Tahsin Ömer Tahaoğlu, published by IRCICA and the Ministry of Information of Kuwait, Kuwait, 1988 (illustrated, in Arabic), English edition Istanbul, 2000 (illustrated). Out of print, English version available via CD at the link.